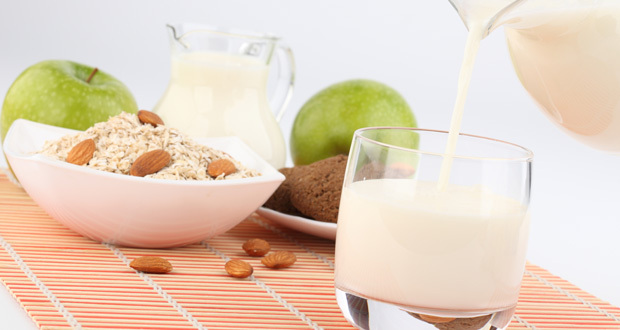 Almond milk has half the fat, calories and carbs of 2% milk. The beauty of making your own is you can control how much you want to sweeten it and and you can also flavour it with low carb, high fibre berries. If you are following a Weight Watchers diet plan milk carries the following point values per cup: whole milk, 4 points; 2 percent milk, 3 points and 1 percent or skim milk, 2 points. Almond milk is dairy free, lower in carbs, lower in sugar and only 2 Wieght Watchers points. Put almonds in very large bowl. For every 1 cup of almonds, add 3 cups of water. Soak overnight (at least 8 hours). Pour almonds and water into blender, and blend until almonds dissolve into water. Place a sheet of cheesecloth over large bowl and pour the almond water over cheesecloth (to catch small almond bits). Squeeze excess liquid out of cheesecloth/almond bits into bowl. The almond bits can be dried and further ground to use as almond flour. Refrigerate in pourable container for 24 hours. Can be sweetened with ground vanilla bean, vanilla extract, almond extract, stevia, honey or ground dates. Can also be salted for extra flavour. You can add frozen fruit to the milk to make fruit flavoured almond milk. Store in fridge for up to 1 week.